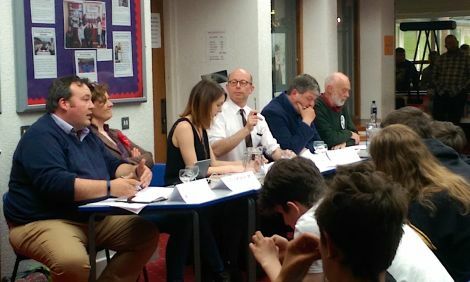 Candidates for the Orkney & Shetland seat at next week’s General Election faced the questions of pupils at Brae High School’s hustings event on Tuesday afternoon, writes former pupil Patrick Mainland. Chaired by history teacher Irvine Tait, the debate saw five of the six candidates – UKIP’s Robert Smith the only absentee – put to task by students on a range of issues. Pupil Helen Balfour opened up proceedings by asking whether or not the election was a two-horse race between current MP, Liberal Democrat Alistair Carmichael and the SNP’s Miriam Brett, thought to be the closest challenger to the long-held Lib Dem seat. Carmichael, the isles’ representative since before many in the audience were born, invited people to judge him on everything he has accomplished in his 16 years, mentioning his hand in matters such as keeping the Coastguard station and emergency tugs among others. Brett made her priorities clear in opposing austerity and the ‘uphill battle’ against the UK-wide current economic situation. Unsurprisingly, some of the other candidates rejected the idea of a two-horse race, with Labour’s Robina Barton making it clear she is no fan of tactical voting. She followed up by saying her party’s vision was to work towards a more equal society, at contrast with the SNP’s vision for independence. Campaigner for Shetland independence Stuart Hill was adamant that it was a two-horse race between him and the political establishment – vowing for a massive shakeup should he be elected. He seemed full of confidence that the northern isles electorate were behind him. On Brexit, Conservative candidate and self-confessed Remain voter Jamie Halcro Johnston was, perhaps understandably, on the defence of his party’s time in government with regards to issues such as the upcoming Brexit negotiations. It was on two very much contrasting subjects that the debate really shone – education and defence, two issues evidently important to young people. There was much discussion on the Curriculum for Excellence, a devolved issue, with Brett facing questions about her party’s implementation of this, as well as falling literacy rates, since coming to power in Scotland in 2007. Amongst the lively discussion, there were smiles when one pupil offered a suggestion – that we follow Finland’s lead and shorten the school day to help improve the standard of education. The debate was augmented well by regular insights from the Brae students – making it more entertaining and giving young people a real chance to put candidates on the spot. Many were keen to hear views on the Trident nuclear weapons system – with much talk on whether it was an effective deterrent or whether it was outdated for the current world we live in. So was there a winner? It wasn’t an easy one to tell, but the pupils of Brae High definitely came out on top with their high level of political engagement to a hustings that could have gone on much longer if time had allowed. Just a shame so many of them are currently unable to vote next week.